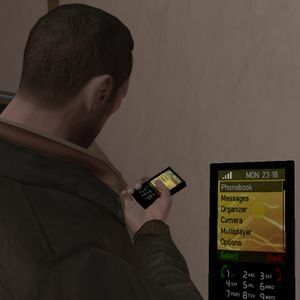 In [[Grand Theft Auto IV]], [[The Lost and Damned]] and [[The Ballad of Gay Tony]], '''cheats''' are activated by typing the cheat phone number into [[Niko Bellic]]'s, [[Johnny Klebitz]]'s, or [[Luis Fernando Lopez]]'s [[Cell Phone|mobile phone]]. After this has been done once, the cheat will be stored in the phone, and accessible from the "Cheats" menu there. Be warned that entering some of these cheats in the game will disable certain [[Achievements in GTA IV|achievements/trophies]], so do so at your own risk. Accessing [[secrets]] is different from cheats, and will not affect the status of gameplay. There is no way to unblock the achievements except for re-loading the game without saving after the cheat has been activated. However if a player uses any of these cheats but still desires all the achievements, they can simply start a new game file and complete the first mission. Then there are no blocks on the achievements. Because of the way that cheats work, they may have undesired effects on gameplay, such as [[glitches]]. Entering some of these cheats in the game will disable certain [[Achievements in GTA IV|achievements/trophies]] only on the active save file; it does not prevent the player from achieving 100% completion. If achievements are blocked, they can be unblocked by loading a save file without blocked achievements. Cheats may have undesired effects on gameplay and can introduce [[glitches]]. Inputting cheats does not block the player from getting 100% completion, just achievements/trophies. Note that in the [[PlayStation 3|PS3]] version of the game, reloading the game file will make the trophies available, provided the player does not use those cheats again during the new session.